Playcon are fast becoming one of the most innovative and quirky online slot games developers on the market by building a reputation for video slots that are both detailed, possess narrative, and are extremely enjoyable to play. 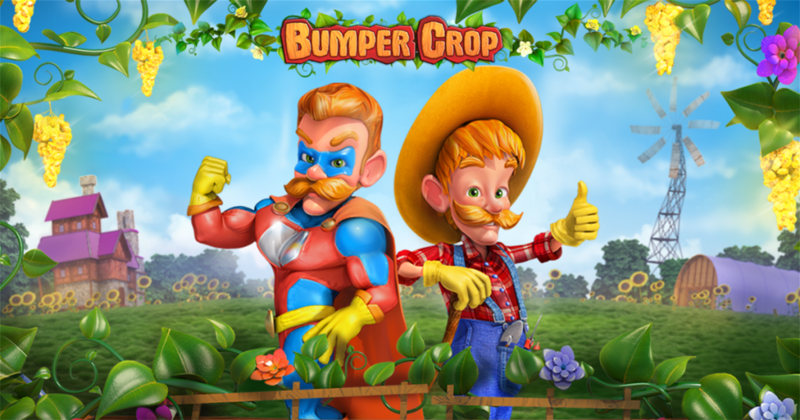 Bumper Crop is a 5 reel classic centred around the exploits of a friendly farmer whose golden fertiliser somehow falls on him, transforming him into somewhat of a superhero in the agricultural industry. Spin and deposit today, Bumper Crop will simply not disappoint. Trust us! Playson was established as company in 2012, making it one of the newest software develops on the scene. This fresh-faced company has already designed 30 high definition online slot games, and have many more new and adventurous ideas in the pipeline. They may be new to the industry, but they have already started to expand showing their ambition and ability to compete in this business. They already employ more than 250 members of staff globally and have established business relationships with some big names like Leander Gaming, 1X2 Gaming, Bet Construct and Quickfire. If you're interested in slot promotions then join & play now. Don’t be fooled into thinking that this is just another farm themed online uk slot games. Bumper Crop comes with a dose of magic to boost your crops, and cash! All kinds of prizes and coins are waiting to be unearthed in this colourful online slot game. You have 5 reels, and 27 paylines to help you reap in this year’s harvest. To get started you will need to stake your coins on the payline, coin values can start from 1p to £5, which means you could be spinning away from 27p up to £135 per game. The graphics are done to an exceptional standard, they’re crisp and smooth. The cartoon animations are comical and entertaining, accompanied with farm-yard sound effects that will guarantee a fun ride. On the reels, you have your rustic card playing symbols, they are the most common so they represent the lowest value symbols. You also have a Watering Can and a Bag of Seeds symbols, these will pay out between 150 and 100 coins when you land 5 of a kind on the reels. Because crops need sunlight to grow, the Sun symbol is the highest paying regular symbol. 5 of these will reward you with 250 coins. Read more about mobile casino deposit and claim your free spins today! Bumper Crop comes with two Wild symbols. The Wild Tree and the Super Wild Tree. The Wild Tree symbol will appear on all the reels except the 3rd one. When the Wild Tree appears, this will trigger the Free Spins feature. How many Free Spins you receive depends on the amount of fruit you find in the tree, you will either get 1, 4 or 10 Free Spins. During the Free Spins feature all the other grown trees are frozen in place while the new tree defrosts. If the Super Gardener appears he can add 1 growth stage to the tree on any reel. 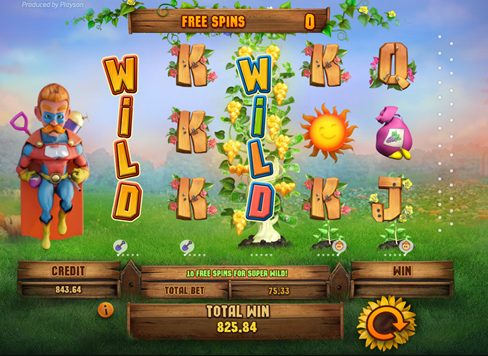 The Wild Tree can grow on any reel except the 3rd, and expand on the whole reel giving you a further 3 or 4 Free Spins. The Super Wild Tree can grow to expand on the whole of the 3rd reel, and give you up to 10 Free Spins! After every winning spin, you can also play a Gamble game, where you can double your winnings by guessing the colour of the card, or quadruple your winnings by guessing the suit. If you guess incorrectly you forfeit your bet. For more information, visit https://www.easyslots.com and start spinning today! This is a bright and colourful game, with a fun and quirky farm theme. The betting range will appeal to both high and low limit players, inviting anyone to come and see how much cash can be unearthed. Now try one of our popular online slots game here at https://www.easyslots.com/.